Universal health coverage, real or selective? Time for global health advocates to unite IHP news 240: Can the global health community unite around UHC? It is not the size of a conference which determines its quality. 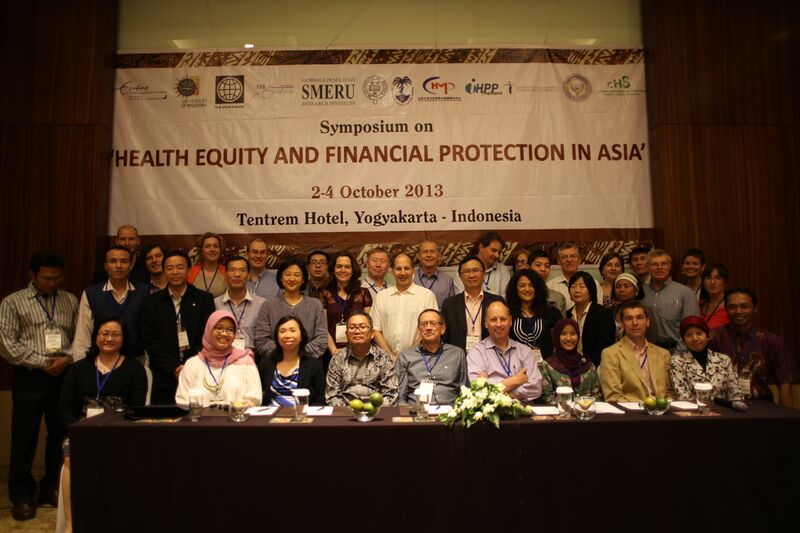 With around 40 other experts, we had the chance this week to take part in the final conference of the Health Equity and Financial Protection in Asia (HEFPA) research project. The event took place in Yogyakarta, Indonesia. HEFPA was an ambitious project: the aim was to evaluate the impact of a variety of health financing initiatives in 6 Asian countries: Cambodia, China, Indonesia, the Philippines, Thailand and Vietnam, with a focus on access to health care and households’ protection from the financial burden of medical expenses. This 4-year project, led by Eddy Van Doorslaer, Owen O’Donnell and Adam Wagstaff, mobilized a team of very talented researchers. As you might have guessed from these names, emphasis was on rigorous quantitative methods. During these 3 days, we had the opportunity to listen to the findings from the 6 countries. It was a very rich event and you may be somewhat surprised, but econometrics were nowhere to be seen: the focus was on the results and the lessons for policy making. We had fascinating discussions based on empirical analyses and enriched by comments by a few senior international experts and national policy makers invited to the event. The HEFPA studies will be published in the near future – several are already available as working papers by the way (tips if you are interested: check health economics journals for the next 1-2 years, follow @EllenVandePoel and @adamw2011 on Twitter, and of course check this newsletter!). In this editorial, we will share some non-rigorous thoughts, related to a non-representative sample of the presented studies. On day 1, we heard about different experiences and strategies for expanding (household) coverage so that also households working in the informal sector (a notoriously hard to cover population segment) would be covered. We learned from Vietnam that a voucher scheme – with a financial subsidy for the premium of 25 % and the transfer of information – aimed at encouraging people to enroll in a voluntary insurance scheme did not bring the results hoped for. A similar experience in Philippines was a bit more successful, partly because it paid attention to the different barriers households encounter when they want to enroll (such as how to complete the subscription form!) and perhaps also due to a higher level of subsidy (50 % of the premium). After watching these presentations, we realized that selling a health insurance scheme to households is not an easy job. Whether it’s a State agency or an NGO trying to persuade households, they face an uphill task (even if we learned that tablets now allow promoters to use movies for this purpose – in India, even with seductive Bollywood actors! ). The height of the premium is an important, but not the only, barrier to enrolment in voluntary insurance (and subsidizing part of it is thus important); what the enrollees will get in exchange for the payment (the quantity and quality of the benefit package) also matters a lot – and this is an issue in many places. But even with high quality care, it is probable that many households won’t subscribe. At some stage, this made authors of this editorial wonder whether compulsory enrollment or user fee reduction (Rob Yates, who was with us, argued for user fee removal), would not be the best way to nudge people towards appropriate coverage of their own health risks. But UHC encompasses making choices on societal values, including freedom (for households, providers…). Asian countries will find their own way to make UHC a reality. During the first two days, there were several presentations on health insurance schemes (especially those targeting the poorest – a popular strategy in Asia), but also on innovative health care financing arrangements (pay-for-performance, capitation payment, vouchers, health equity funds…). All studies reported on the effectiveness, but several also provided quite a good view on the care given to the design and implementation of the schemes. We may be biased, but we saw, across presentations, an emerging lesson validating another side of our own professional experience: re-inventing one’s health care financing strategy cannot be improvised; technical guidance can be helpful. In Indonesia, hundreds of district bureaus launched new schemes, but probably because of a lack of coaching, they developed quite simple interventions which did not lead to real changes. One can also doubt whether a thousand flowers will bloom in China this time. Conversely, we were quite impressed by the pay-for-quality scheme (with a yardstick competition component) piloted by Winnie Yip and colleagues in China: they showed how things are indeed difficult, but we also got some interesting ideas which will deserve to be tested elsewhere. In general, our feeling is that many health care financing policies would benefit from efforts by policy entrepreneurs to make the theory of change on which the intervention rests more explicit, including by contextualizing it. This is an aspect where scientists can contribute, and we may prevent a few big failures by putting more effort into that. At the Yogyakarta conference, there was the evidence (plenty of it! ), but also the (equally numerous) discussions, during the sessions and in the corridors. Let us just pick one among many. It is clear that we do not know much yet on the alternative possible paths (including pace and sequencing) towards UHC and their relative advantages. This indicates a broad avenue for scholars, political scientists but also economists – political economy is an under-developed branch of health economics, we regret to say. We know some of the objectives: UHC requires pooling of resources and illness to the extent possible. We know the starting points: often the co-existence of different schemes (one for civil servants, one for the poor…) with varying generosity, often with a lack of appropriate coverage for households from the informal sector – the middle of the so called UHC ‘sandwich’. At international and national level, this situation is pushing attention towards developing a specific (insurance or insurance-like) scheme for this informal sector group or towards including it in an existing scheme (see Thailand with its 30 baht scheme). This certainly is a priority, but one should not forget that UHC is about 3 dimensions: population coverage indeed, but also benefit packages and height of the remaining out-of-pocket payment. We don’t give away a secret if we say that over the last years, most attention has gone to the first dimension mainly. This is partly due to the emphasis put on some (admittedly, very successful) experiences (like the Thai one – by the way, we heard again strong evidence on its effectiveness), but also owing to the term universal health coverage itself. As a matter of fact, in many countries identifying themselves as still far away from UHC, there is already some coverage for everyone through government-financed health services. We also noted Adam Wagstaff runs a panel discussion like a panel data regression – it almost felt like art. Adam had the opportunity to come back on his (by now notorious) assessment that UHC is ‘old wine in a new bottle’. UHC is indeed about ensuring that everyone gets the health care they need and protection from the financial burden the utilization of health services entails. This is exactly what HEFPA was about.